At a recent lecture a well-educated reader asked me the question I have been dreading. "I loved your book," she said. "But I read the whole thing looking for more about the Karl Thaxter theory of the murders. You barely mentioned him." "It was a calculated decision," I told her. "The theory that Celia Thaxter's son Karl killed two women on Smuttynose Island is absolute hogwash. I didn't want to dignify that conspiracy theory with anything more than a footnote." There isn't a scintilla of evidence for this ridiculous conspiracy theory. Karl was on Appledore Island with his mother on the night of the murders in 1873. But all the evidence shows that Louis Wagner was the killer. So where does the theory come from? Far as I can tell, it was conjured up in recent decades by a ferryboat captain who got tired of telling the story of the murders over and over. Not knowing all the facts, the captain wanted to insert a little more drama into the infamous story for tourists visiting the Isles of Shoals. Like other false theories, it was born out of Wagner's claim of innocence. But Wagner, as the trial transcript proves again and again, was an inveterate liar. "Karl had been injured at birth and was subject to fits of temper and depression...He was born in 1852 and would have been 21years old at the time of the murders." Any suggestion that Karl was involved, Bob Tuttle wrote, "is so tenuous that it doesn't merit any suspicion." The idea that Karl was in any way violent, Tuttle notes, comes from a letter written by a man who, as a boy in Newtonville, MA, had teased Karl for his mental deficiencies. Karl, harassed by the high school boys, reportedly turned to them and said, "Do some of you want to get killed?" Bob Tuttle concluded, "I don't think a great case can be made of that." Unfortunately, these silly rumors take on a life of their own. I'm guilty of repeating the "Karl Theory" when I began writing about the murders in the 1990s. Since then, we are slowly learning more about Karl, who was a talented Victorian photographer. Recently a number of photographs taken by Karl were donated to a local archive. While researching my book I spend a good hour studying roughly two dozen portraits Karl took. We don't know who the people depicted are, but they may include Norwegian immigrants who worked at the hotel. I was hoping to find photographs of the murder victims, Karen and Anethe Christensen, but there is no way to tell if they are depicted. Karen was not pretty, according to Celia, and shy. Anetthe was only at the Shoals a few months before she was killed. 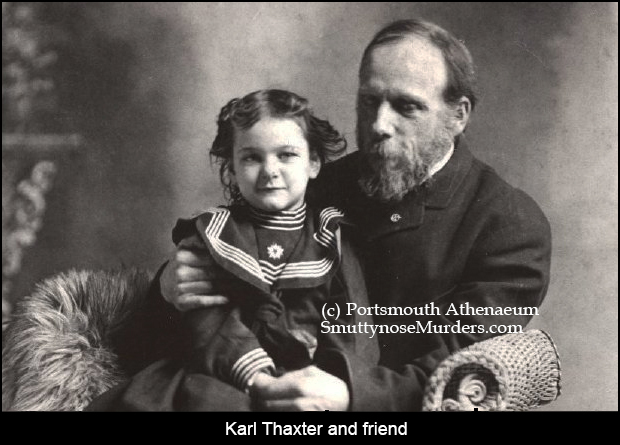 Digging deeper into the life of Karl Thaxter is on my to-do list. I made a gallant attempt to contact the former ferryboat captain to confirm that he was the author of the Karl theory, but I was not granted an interview. 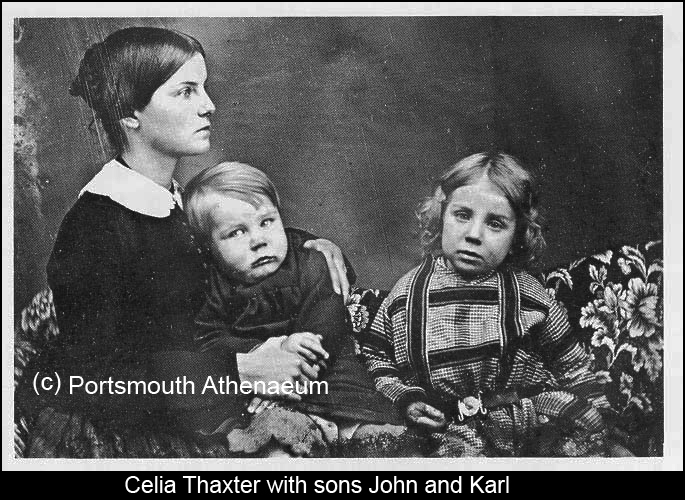 It has been further suggested that Celia Thaxter wrote her famous essay "A Memorable Murder" in order to divert suspicion away from her son. That's silly, of course. No one ever considered Karl a suspect at the time of the murders. He is not mentioned in the trial transcript or in the 200 newspaper articles I've read. Celia's groundbreaking true crime essay in Atlantic Monthly grew out of her frustration that Louis Wagner might not be hanged for his horrific crime that had shattered life at the Shoals. Maine, at the time, was considering abolishing the death penalty and Celia wanted to see him hanged. 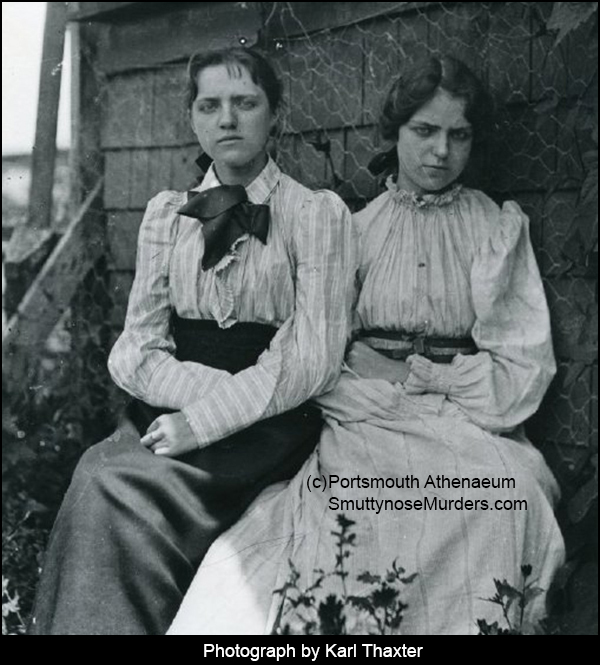 If she felt any guilt over the murders, it was certainly because her mother Eliza Laighton had fired Karen Christensen from her job at the Appledore Hotel just prior to the murders. If Karen had not been sleeping in the kitchen of the Hontvet House on Smuttynose, perhaps, Wagner's robbery attempt might have succeeded. Had he escaped without killing two victims dead and a third alive, we would never know the robbery took place. Wagner was missing for 11 hours, seen returning to Portsmouth by many witnesses, and had motive,, means, and opportunity. He was tried, convicted, and hanged. So please, let's leave poor Karl Thaxter out of the equation. (c) 2015 by J. Dennis Robinson. All rights reserved.